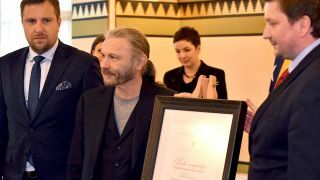 Bruce Dickinson has been made an honorary citizen of Sarajevo during a weekend ceremony to mark the anniversary of the city’s liberation in 1945. The Iron Maiden frontman and his band Skunkworks played in Sarajevo in 1994 in the middle of the siege of the city – a battle which lasted three and half years and claimed the lives of more than 13,000 people. Dickinson walked through the centre of Sarajevo, meeting people and signing autographs and said: “It’s a great honour to be given the honorary citizenship of Sarajevo. “In a world where things only last for about five seconds on social media, people are still remembering it. That’s really quite something. The film Scream For Me Sarajevo documenting the concert and the war surrounding it was released in cinemas last year.